For those who don't have a heart pan, one can easily make a heart-shape cake with a circle and a square pan. 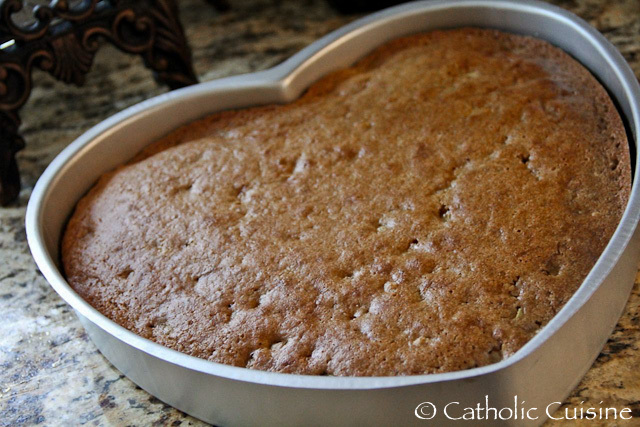 Simply cut the circle cake in half, and place each half along two adjacent sides of the square. Trim the square if needed. The French tradition is also to say about unmarried women getting close to their 25th birthday,"elle va coiffer Sainte Catherine". I am not sure whether the translation should be, "she will do St Catherine's hair" or ,"her hair will look like Saint Catherine's". 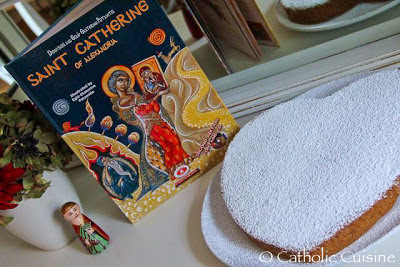 The beautiful book accompanying the cake may carry the answer...By the way, could you please share the name of the author? Thank you for your interesting and apetizing post! The book pictured, Saint Catherine by Dionysios & Egle-Ekaterine Potamitis, is one that my husband purchased at a Greek Monastery Gift Shop he drove past on his drive home from a wildfire assignment a few months ago! It is available on Amazon here, or directly from the publishers. You can also listen to an audio version here: Part One and Part Two! "In the 12th century, St. Catherine was named the patron of unmarried women. So on her feast day, November 25, it was customary to expose her statue in all the churches of Paris. The oldest of the marriageable women would place a starched cap on her head, while all the unmarried female workers would wear paper bonnets in their hair. This gave rise to the French saying, common in France and French Canada, "to do St. Catherine's hair," meaning "to remain an old maid." The same custom was found in Brittany and Normandy where the statue was dressed up in the local style." Oh what a wonderful, relevant blog this is! I love that you pay attention to our liturgical calendar in this way. Thank you for doing what you do!